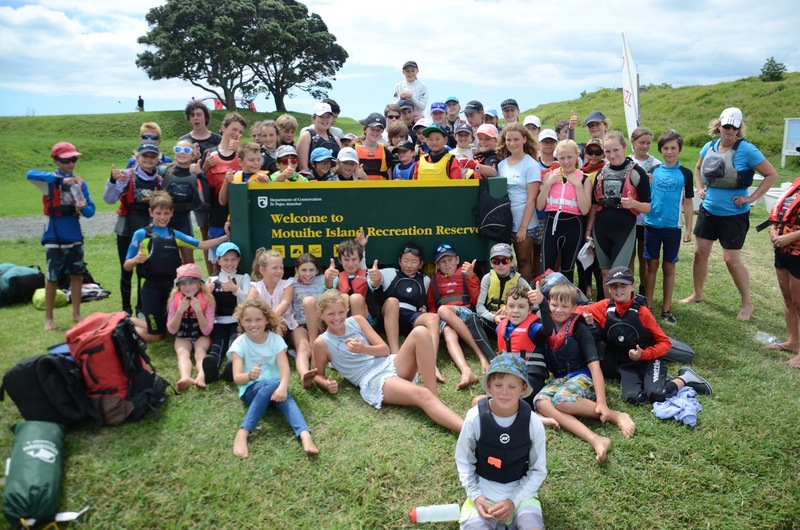 Kohimarama Yacht Club’s traditional away-weekend was held in over the weekend of 5th/6th March, 2016. As always, it coincided with the Round the Bays run, when club sailing is not possible due to the extensive road closures. 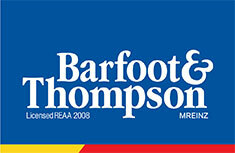 Unfortunately, the 2015 event was cancelled due to appalling weather. This year, the weather could not have been better. 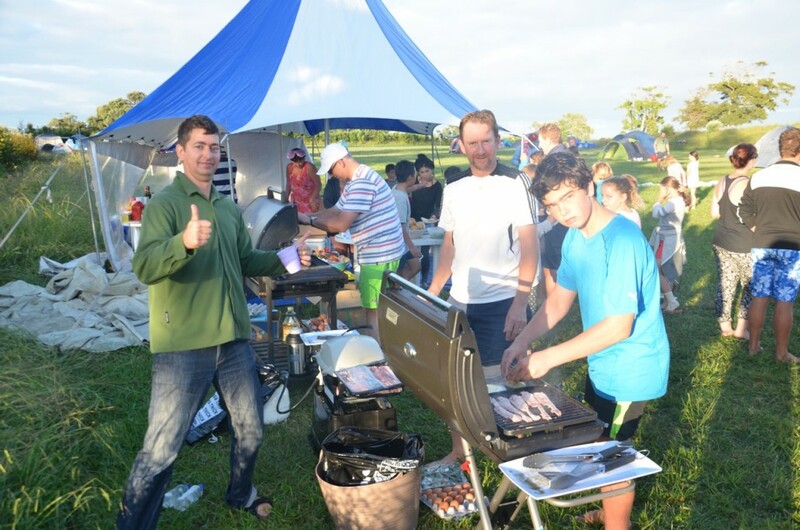 Although it was a little late in the planning, there was still a great turn out, with close to 120 sailors and family spending the Saturday night camping on the “Department of Conservation” administered island. Wayne Angus and Jane Evans were instrumental in the planning, and arranging of the event. A very clever plan was hatched, for a barge to transport all the luggage over to the island, on the Friday night. On all accounts, the advance party of dads, who went over early with the barge, were well rewarded for their work in setting up, with plenty of cold refreshments. On the Saturday morning, a large fleet, comprised of young learn-to-sail through to the youth starling sailors, set off from Kohi under sail. A small flotilla of support boats, carrying family, accompanied the sailors for the five nautical mile journey. Never giving up the opportunity of a yacht race, the initial leg of the journey was to a finish line off Jason Morgan’s “Silver Bullet”. 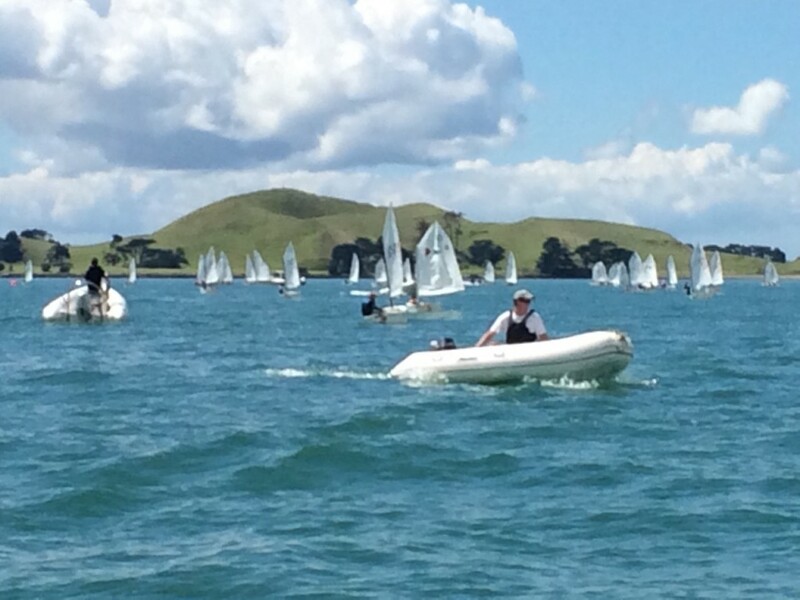 Unfortunately, the wind then dropped right out and most of the yachts required a tow through from Browns Island to Motuihe. The peaceful Island was quickly transformed to action central. Conditions were perfect for wake boarding, knee boarding and biscuiting. Later on, any thought of roughing-it type camping was well extinguished with an exquisite dinner. Although the dress up theme was “on an island”, the music flavour was reminiscent of the “Love Boat” theme. Later on, a ship wrecked survivor washed up on the beach. The poor man, who was draped in seaweed, bore a striking resemblance to Rawdon. Rest assured, he recovered well with a bit of rehydration and a blanket. While the youngsters played searchlight, the adults shared stories. We also were also privileged to have an unnamed senior club member perform a wicked rap. Sleep was finally had, when the batteries of the commodore’s megaphone finally went flat. Sunday morning was welcomed in with bacon and egg baps. Elizabeth Woodward was very kind to share her 11th birthday cake with us all. The sailors were treated again to all variety of objects being towed behind RIBs. 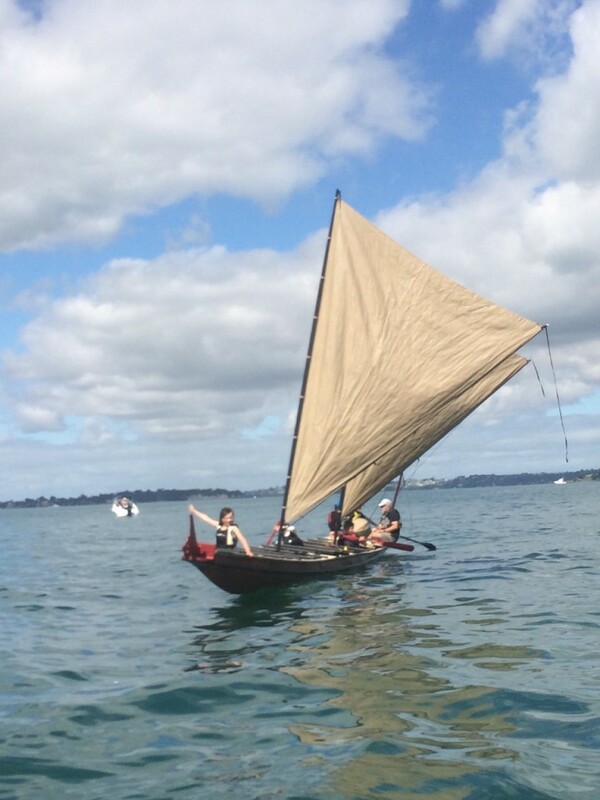 We even had the privilege of a visit from Kim Admore, of Yachting New Zealand, in his spectacular sailing waka. No rest was to be had. 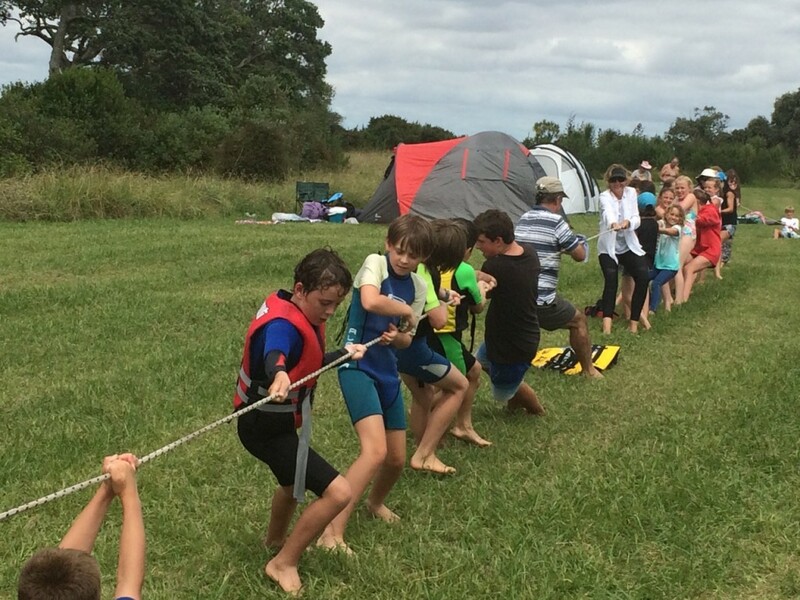 So after indulging in too much lunch, the boys were narrowly beaten in a Tug-of-War. Protests were lodged that the girls had received outside assistance. Just when we were starting to settle in to island life and consider a search for tuatara, it was time to set off for home. The return sail turned out to be a long upwind beat, in moderate wind. 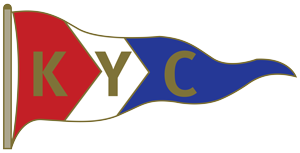 Huge praise goes out to some of the young Learn-to-Sail and Learn-to-Race sailors, who made it the whole way home, unassisted. Many thanks to all those involved in organising this successful event. Thanks to Jane and Wayne for their huge effort allowed for this fun filled event. Also thanks to the kind DOC ranger, who assisted in transporting the luggage up the hill and for giving the parade ground an extra mow. The away weekend has become an integral part of the Kohi calendar. Friendships and bonds are created between sailors and parents alike. 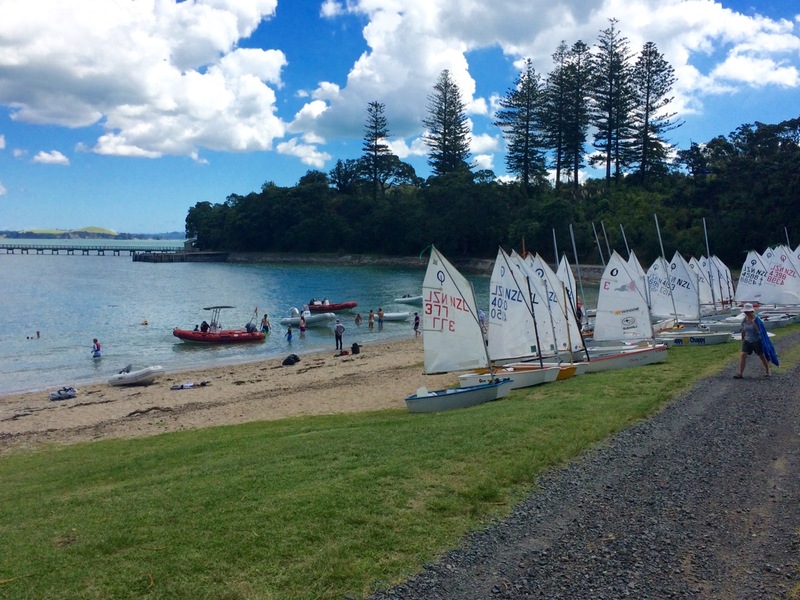 In the brief pause from competitive sailing, we can get to further strengthen the comradeship and team inclusion, that has been part of Kohimarama Yacht Club for the past 75 years. As long as this event continues, the club will hold good spirit.